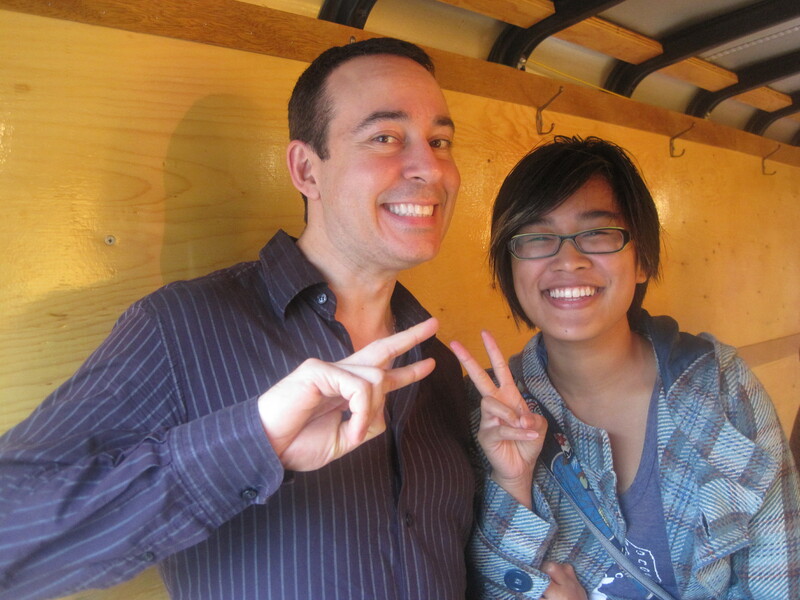 Joseph Mallozzi's Weblog: September 20, 2010: Trailer, Teasers, and Takoyaki Bombs! September 20, 2010: Trailer, Teasers, and Takoyaki Bombs! Holy crap! I was just in post, approving the BIG Stargate: Universe season 2 trailer. In short – it rocks! I was a huge fan of the MGM-produced trailer for SGU 1.5, but this one, I dare say, beats it. We’re just awaiting delivery on two more finished visual effects sequence and then we’ll be good to go. You can expect to see it tomorrow. A huge thanks and congrats to Steve M. for his hard/spectacular work. In the U.S.: Tuesday, September 28 (9 p.m. E/P) on SyFy. In Canada: Friday, October 1 (10 p.m. E/P) on SPACE. In Australia: Friday, October 1 (8:30 p.m.) on SCI FI. In the U.K.: Tuesday, October 5 (8 p.m.) on SKY1. The anticipation continues to mount and, if you’re the type who enjoys gathering every tidibit and teaser of information with a mind to assembling a clearer picture of what’s in store, check out this article. The gang at Gateworld.net have done some of the work for you. But be warned, potential spoilers abound! Commander Carl at the helm. Putting the finishing touches on the bridge. Last night, Akemi and I met up with our friend Sheryl for a little foodie foray in Richmond. 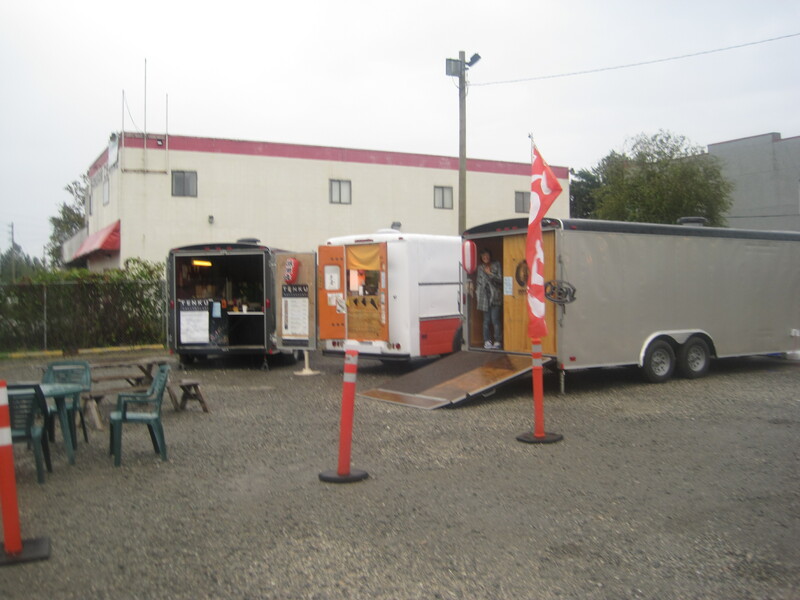 In a parking lot situated across from the River Rock casino stand three modest trailers. 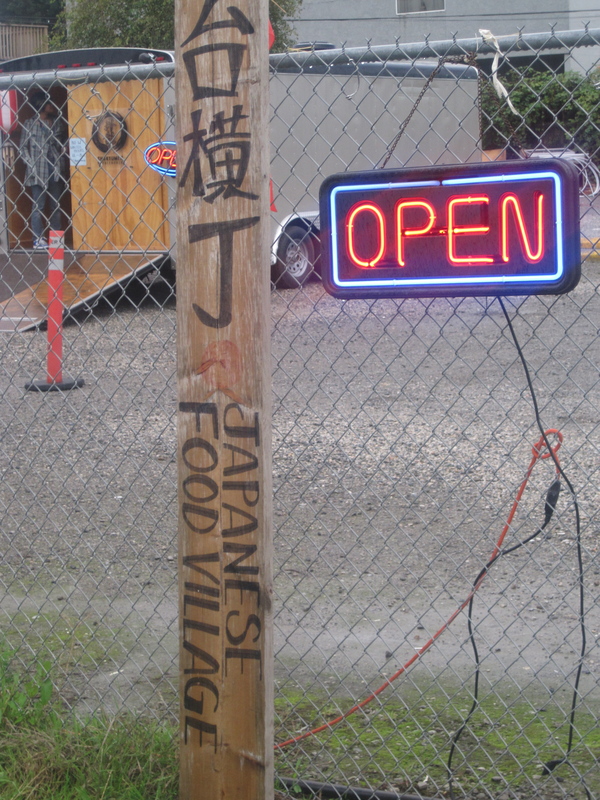 Welcome to Japanese Food Village! The pouring rain failed to dampen our spirits. The same cannot be said for my socks. 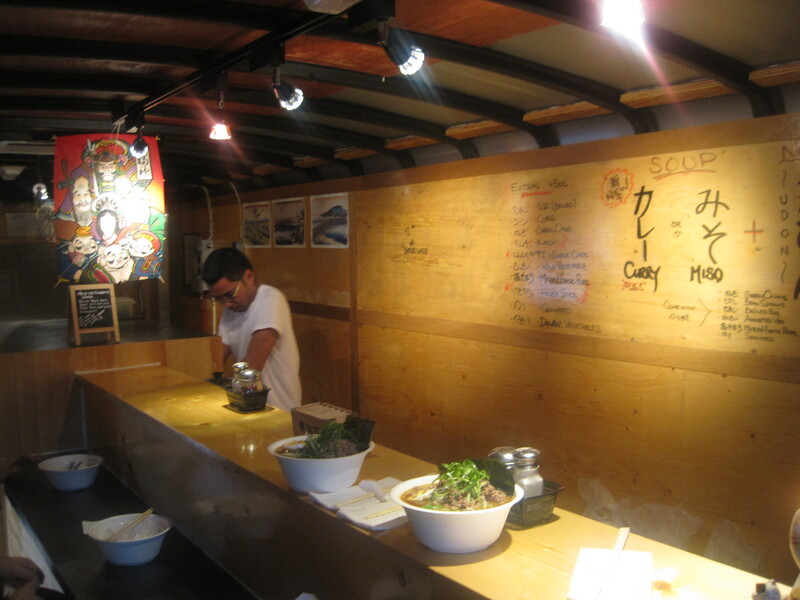 It's like a tasty Tokyo trailer park. 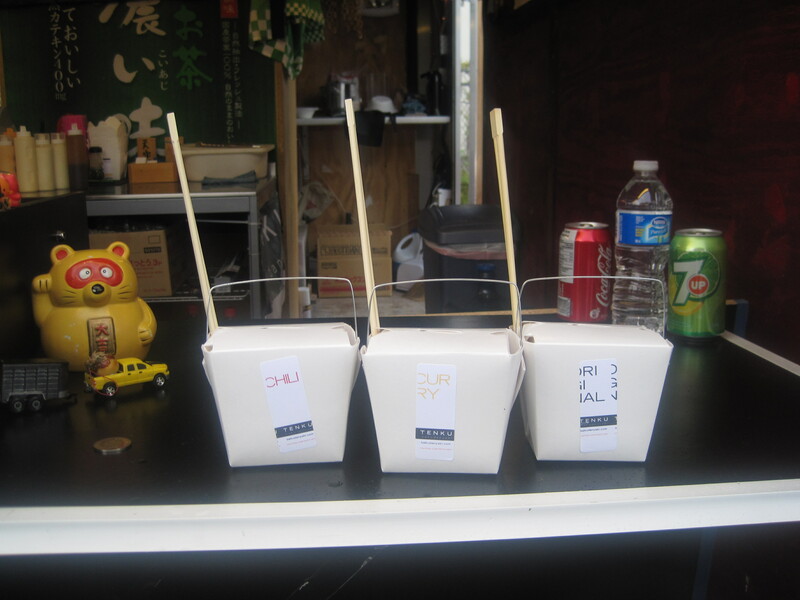 The one on the left sold takoyaki bombs, the one in the middle sushi, the one on the right ramen. Akemi and Sheryl brave the elements for takoyaki. We went with three flavors: original, curry, and spicy mayo. Totemo oishikatta. And enormous! We took refuge from the rain in trailer #3. With a bowl of curry ramen. Sheryl and I practicing for our next Japan trip. 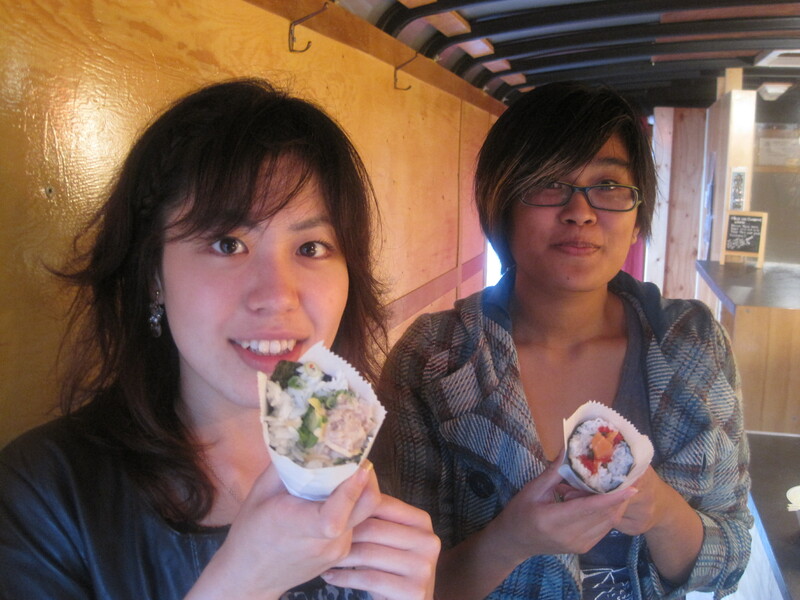 Akemi and Sheryl show off the sushi cones: toro on the left and spicy salmon on the right. 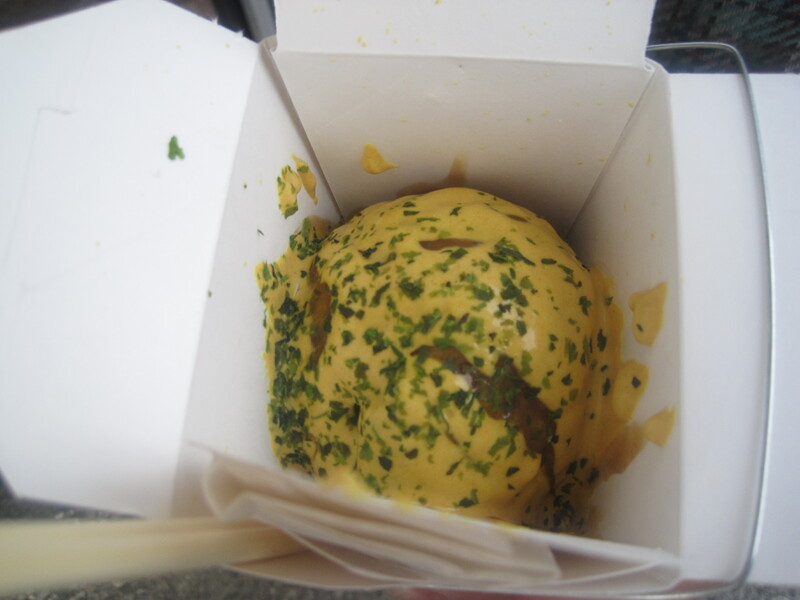 Damn, those takoyaki bombs were good. Despite having already eaten one the size of a softball, two sushi cones, and a bowl of ramen, I still wanted to go back for seconds. Although I knew I would feel bad missing out, I also knew I’d feel just as bad, if not worse, actually eating a second one so I passed. Maybe next time. Previous Article September 19, 2010: How satisfied are you with the ship’s capacitors? Very satisfied? Satisfied? Somewhat satisfied? Somewhat dissatisfied? Dissatisfied? Or very dissatisfied? Next Article September 21, 2010: A plethora of pics! It’s sad to think that today was David Hewlett’s last day of filming on the SGU set! Hey, Joe, do you know if Ivon filmed any behind the scenes stuff of David Hewlett & Robert Picardo for the dvd special features? Also available are dvds, comics (including some huge vintage collected sets), magazines, and other collectibles (plus many of the non-auction items are on sale for 14-15% off). I have had a collectible store on Ebay for years with a 100% rating, so if you are interested in any Stargate magazines (or are looking for back issues) you may want to check it out. Hey Joe, look for Jupiter in the night sky tonight. It’s supposed to be visible from shortly after sundown ’till daybreak and is brighter than everything but the moon. Hubby and I were out shortly before 8 here in PA and found it low on the horizon north of and lower than the moon. It is way cool. I’m not asking for spoilers or trying to divulge any information but how do you plan on making the ancients ultimate goal for Destiny something unique and original. Something that will really set the “wow” factor into over drive. I really hope thats not the case here. Looks like Shuttle Schematics being displayed on those bridge Nav/Ops consoles, Wonder what thats all about. I suppose the wait for the VFX will be worth it… but darn.. Ive been waiting for this trailer for so long. Its killing me. But hey, im sure it’ll be tomorrow night in no time. @Barbaro. Second your recommendation for some Jupiter gazing. And a small telescope will let you see it pretty well, even with a nearly full moon. Mr. M. your restraint does you credit. The food all looked delicious. I’m not sure if it’s my imagination, but it seems lately you’ve been rather laconic in your descriptions of the dishes’ tastes. I know you’ve been busy, but a good part of the fun of your foodie reviews is how you use written words to inspire the reader to share in the tastes and textures of the foods. Thanks for the early post, and the time taken away from other activities to share all the goodies with us. Ok, so I went to a local restaurant called Cilantro … it serves Thai food, I don’t know it might be a national chain. It was for extra credit for a Cultural Diversity class. Anyways… What is curry? And is Sake any good? wow would have loved to eat in a trailer….i bet it was an unusual experience…reminds me of the time i was driving to Tulsa, OK and passed an old, off yellow ryder fan with a handmade sign decreeing ” Haircuts 7$”. Needless to say i didn’t pull over but damn, people will put anything in anything. Although those trailers look damn comfy and posh. also, i am so freakin’ stoked that you have cast Victor Garber! I love SGU and can’t wait till season 2 launches. You guys are doing good work. Keep it up. I have even managed to sway some friends into watching and of course becoming fans. And now, Jack Bristow in Space!! anyway, bring it on and keep it up. love your blog and your food always looks so damn tasty. cheers! Sorry to comment again. But, I know in SG1 they had a lot of extra flashing lights, etc. (Carter’s lab is a prime example). When designing the bridge of the ship especially, did you guys make sure that most of the buttons and do-hickies had a purpose? I mean, of course you gotta throw some extra whatcha-ma-hoosits on there for good measure, but for the most part is it practical? Just wanted to stop by to say that I enjoyed Masked. I don’t have any specific questions. I enjoyed all of the stories but liked Thug, Downfall (and I’m not just saying that because it’s your blog – it was a great story with engaging characters, a great premise and a nice ending twist), Cleansed and Set in Gold best. But what impressed me most was the amazing job that Lou Anders did in selecting such a variety of tales! I’ll look forward to reading the comments. Did you have any favorites, Joe? Looks like you had another amazing dinner! 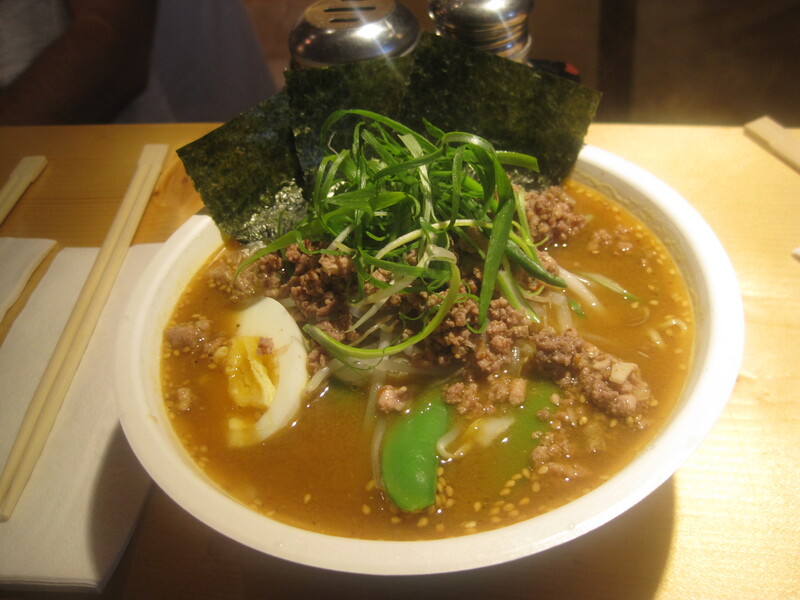 And I love curried beef and noodle soup – that’s my usual lunch Mitsua Market. I also thought I would pass along some information on an e-chapbook that some great writers like John Scalzi, Patrick Rothfuss, Will Wheaton and others put together to benefit the Lupus Alliance of America. You can check out Clash of the Geeks at http://unicornpegasuskitten.com/ . It’s free but donations are welcome. MGM-produced trailer? Screw that, I’m soo watching this one! And forget my “Midway” money question, I already got an answer. 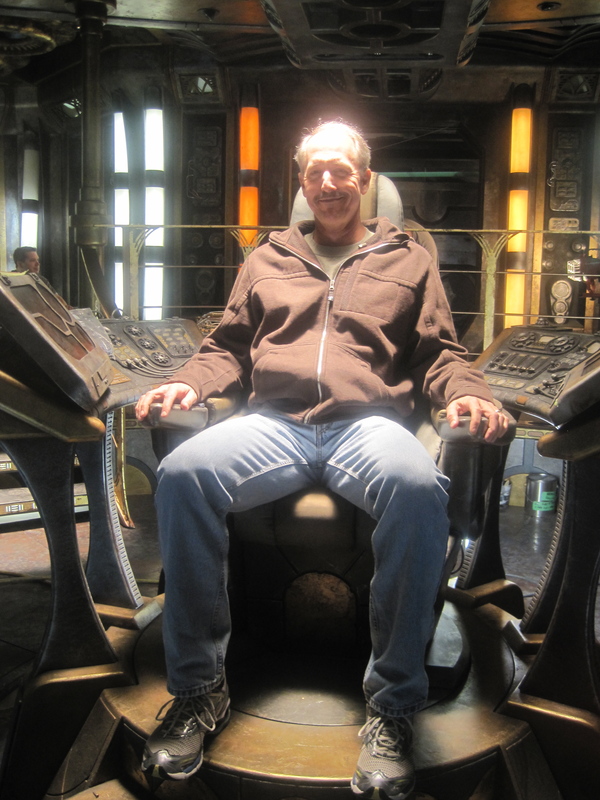 I love that really strong light that’s hitting Carl in the commander’s chair on the Destiny bridge. The new set looks great. I can’t wait till the next season starts. You find the best places to eat! I live in Mississippi, and I’ve eaten in lots of trailers . It is supposed to be 98-100F here today….I’m ready for fall. Man, can I live in that trailer? Love the design inside and the cool slats on the ceiling, just about the coolest trailer I’ve ever seen West of MTVs Pimp Your Trailer. Don’t know if I could go for the grub tho, not feeling the giant round thingies. I was on a big udon salad kick (hot noodles covered in fresh chopped veggies and rice wine vin and soy for dressing) but that has now faded. Am happy with just yogurt and toast for a bit. Barbaro, I will check out the sky tonight, see if I can spot Jupiter. Wish I had a good telescope. Hello =) ça va bien? Moi oui, contente d’être sur votre blog! Merci pour ces photos et la video =)…mais je dois avoué que sgu j’ai décroché depuis quelque temps =(…. SGU’s move to Tuesday will not work for me (darn kids and their cub scout meetings) so I intend to DVR it and watch it on the only night that I have free time, which conveniently happens to be Friday. How will this get recorded in the ratings? Joe, will there be any promotions on other TV channels for SGU? how come Caprica got ads on NBC but not SGU? Only people who have Nielsen boxes contribute towards ratings. If you have one though, it’ll be added to Live+7, rather than the Live+SD than the advertisers are interested in. If you do have a nielsen box, you can simply put your TV on SyFy when you go out. The boxes are sophisticated, but not enough to know if someone is actually sitting in front of the TV when it’s on. Those are some big bowls of food! 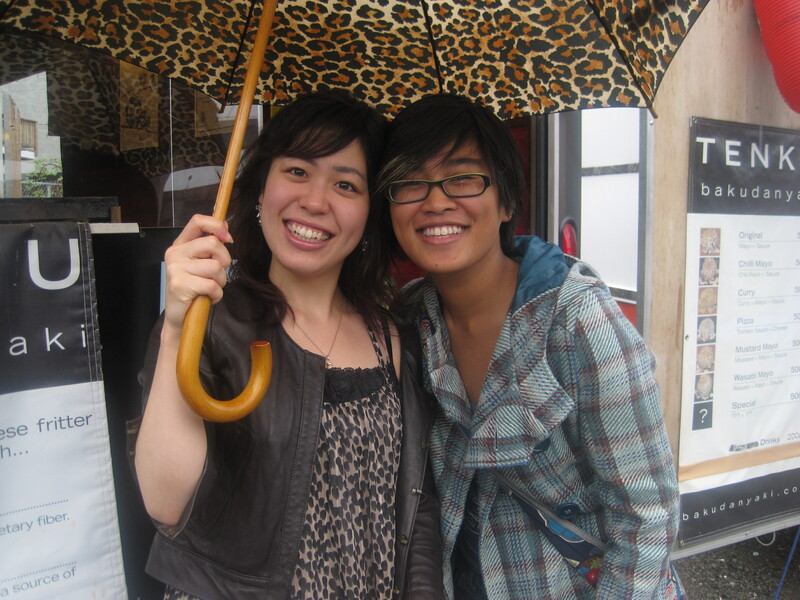 Akemi and Sheryl are sure good sports in the rain. I like the low overhead idea for the Village. Please tell Commander Carl to be careful in that chair, remember Franklin!! ACK! or is he saying beam me up Scotty, right to the craft service truck. hmm, a nice idea. Only one week til the new season, looking forward to adding SGU to my Tuesday line-up. This year has really flown. Maybe it has something to do with Caprica having catastrophically bad ratings? Stargate as long as people know its on stands on its own two feet, however Caprica as a show that costs more to produce than SGU needs all the help it can get. If tuesdays dont work for SGU, put it after Eureka on whichever day it comes back. Eureka is almost a guarenteed ratings booster, did you see Havens ratings dropped 33 percent when new episodes of Eureka ceased? Haven’t posted for a while, but I just wanted to say … I was really looking forward to the start of SGU. 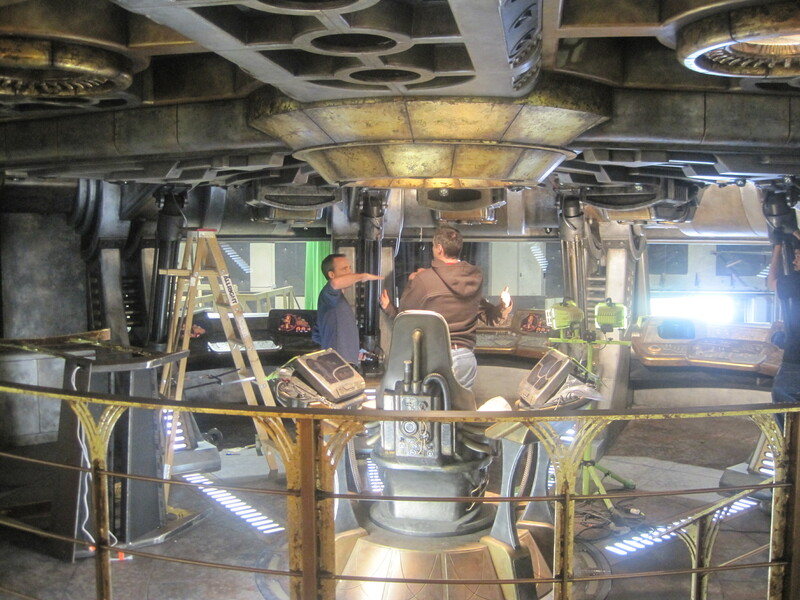 And then I was pleasantly suprised by how much I liked what Brad & Rob had brought that was different from SG1 and SGA. And then very happy with how yourself, Paul and Carl brought even more. To say that I’m really excited to see what’s brought this season is somewhat of an understatement. Just the ideas alone in the first handful of episodes were enough … but knowing what the cast could possibly bring along with it?